Our comprehensive sleep center provides a variety of sleep related services. Learn more in the sections below. The sleep labs at Dayton Children’s are staffed by licensed/registered technicians. Our American Academy of Sleep Medicine accredited sleep laboratories are all equipped with state-of-the-art polysomnography equipment and all studies are interpreted by board certified sleep physicians. 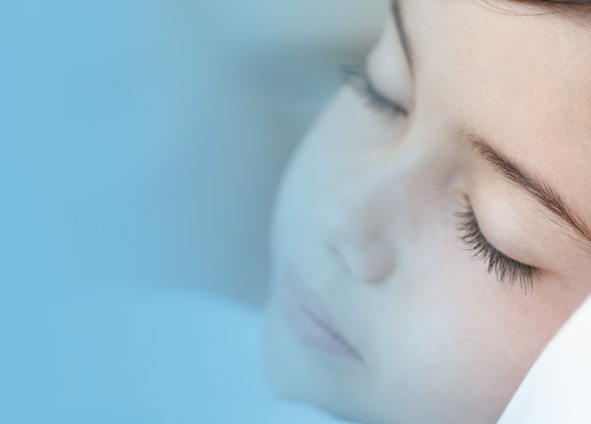 Our sleep center is dedicated to caring for babies, children, teens and pediatric patients with special needs. We have designed the lab so that you or another adult family member has a place to stay with your child during the overnight sleep test. sleep study (polysomnogram) - During a sleep study, a sleep technologist monitors your child throughout the night through sensors placed on your child. Sleep duration, sleep quality, breathing and body movements are recorded on a computer. This detailed monitoring helps us diagnose and treat various sleep disorders for children starting on PAP therapy. The study is used to determine the best pressure settings. multiple sleep latency test (MSLT) – During this test your child will be asked to take a series of naps where the time to fall asleep and type of sleep is recorded. The purpose of this study is to assess the sleepiness of your child after an overnight study in which the quality of sleep has been monitored. Our outpatient sleep clinics focus on identifying the factors that contribute to sleep disorders. Our clinics consultations help parents understand and formulate a plan together for the treatment of their child’s sleep disorder. The upper airway program at Dayton Children’s provides a multidisciplinary approach to the diagnosis and management of children with complex obstructive sleep apnea (OSA). OSA in specific populations of children, such as those listed below, often do not respond completely with conventional treatment. In these children, OSA can arise from the collapse at multiple sites in the upper airway. The identification and treatment of these sites of upper airway obstruction requires a multi-disciplinary approach. Specialists from sleep medicine, otolaryngology, radiology, and plastic surgery collaborate to provide comprehensive care for each child. Individualized care plan is developed through weekly virtual meetings and monthly meetings where advanced imaging is reviewed. Conditions treated include craniofacial anomalies, Down syndrome and persistent obstructive sleep apnea (after tonsillectomy). Behavioral sleep problems are the most common sleep problems in childhood with 15 percent and 30 percent of 2- to 5-year-old children experience regular difficulties falling asleep or sleeping through the night. Not getting enough sleep can affect the child’s learning, mood and behavior. Parents lack of sleep can affect their own daytime functioning. Dayton Children’s is one of only a small number of pediatric facilities in the country to offer behavioral sleep medicine services. Some of the more common sleep problems evaluated and treated in the behavioral sleep medicine clinic include bedtime fears, bedtime refusal, difficulty falling asleep alone, nightmares, sleep terrors, sleep waliking and delayed bedtime. Sleep related problems have been linked in overweight and obese children. Further, both sleep apnea and short sleep duration have been shown to contribute to weight gain. At Dayton Children’s, sleep evaluations are an important part of obesity prevention and management of obese children participating in medical weight loss program. Patients undergo questionnaire assessments of their sleep quality, daytime sleepiness and if indicated recording of sleep duration (home actigraphy monitoring) or overnight sleep (sleep study). Once diagnosed with a sleep disorder, obese children benefit from the expertise of a multidisciplinary team to develop an individualized treatment plan. To overcome the barrier to how often PAP is used, we have a systematic approach to starting and monitoring PAP therapy support. Our respiratory therapists introduce the patient to the equipment and remotely monitor the device usage. Follow-up phone calls are made to all patients to provide support during the process of getting used to therapy. Patients are closely followed up in the clinic where problems related to device usage are addressed and the effect of PAP therapy on sleep quality and daytime sleepiness is evaluated.